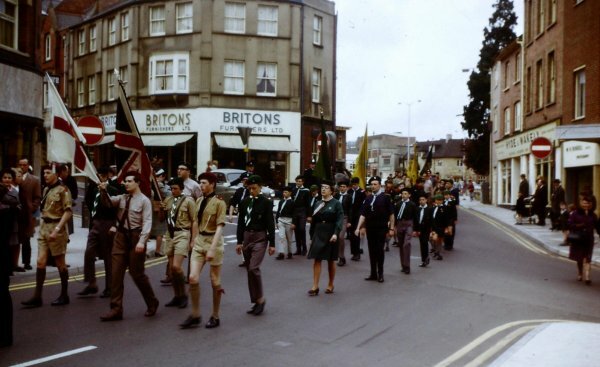 I am most grateful to Andy Keyse for permission to use the following photographs taken by his dad, Doug Keyse, during the 1968 St George's Day parade of the Yeovil Boys' Brigade, Scouts, Cubs, Guides and Brownies. 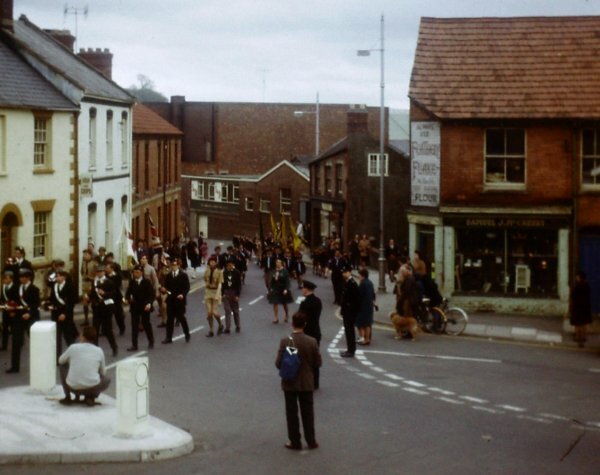 The photographs also bring back many memories of parts of Yeovil as they were fifty years ago. 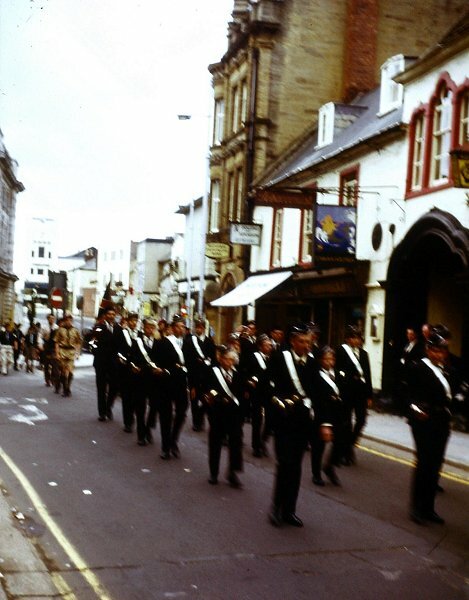 The parade had traditionally ended at St John's church but by the time of this series of photographs of 1968 the church had become too small to hold all those attending the service. 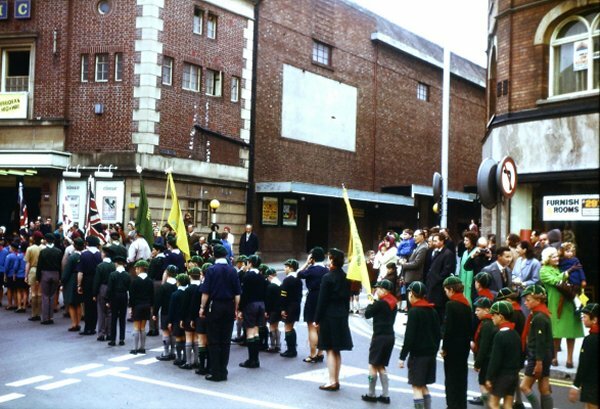 In 1968 the service was held in what was then the Gaumont cinema, simply because it could accommodate the large numbers of people involved in the parade. Andy recalls that a couple of years later the service was held at the football ground in Huish "on a bitterly cold day". 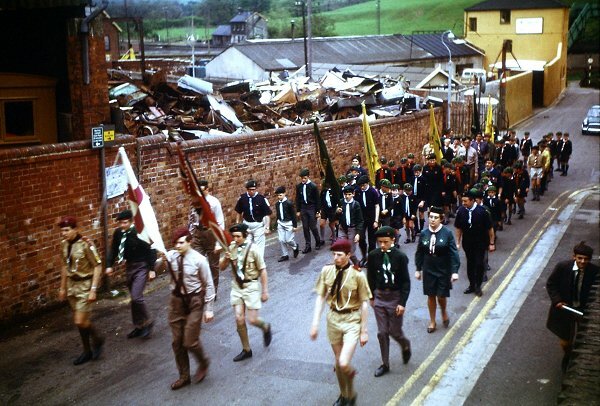 I recall standing in the Borough to watch the parade many times in the late 1980s as my sons took part as Cubs. 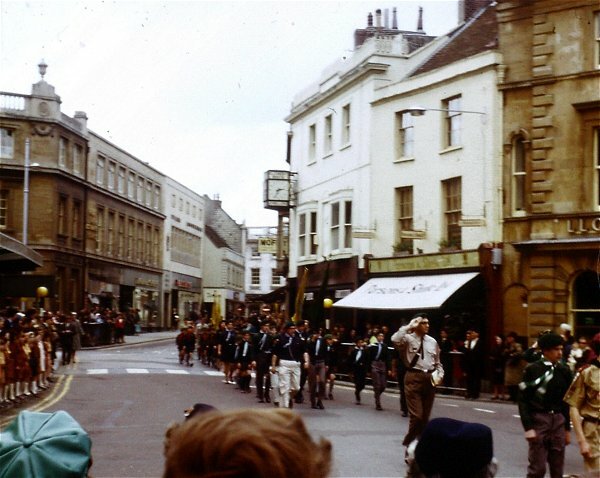 A detachment of Boy's Brigade, Scouts and Cubs assembles at the bottom of Stars Lane. Many people will remember the scrapyard of Johnny Farr at left. In the background are the lower slopes of Summerhouse Hill with the footbridge over the railway at top right. At extreme right is the end of the first house in Summerhouse Terrace. .... and this detachment marches off. From Stars Lane the parade passed into South Street - seen here at the junction with Park Street / Addlewell Lane at right. Of note here are Eden's Fish & Chip Shop at left, the box factory at centre and Sam McCreary's junk shop (sorry, pre-owned bric-a-brac emporium) at right. Passing Bond Street at left. Shortly after this photograph Mr Head's small corner shop was demolished, along with the house next to it, in order to improve vehicle access to Bond Street. 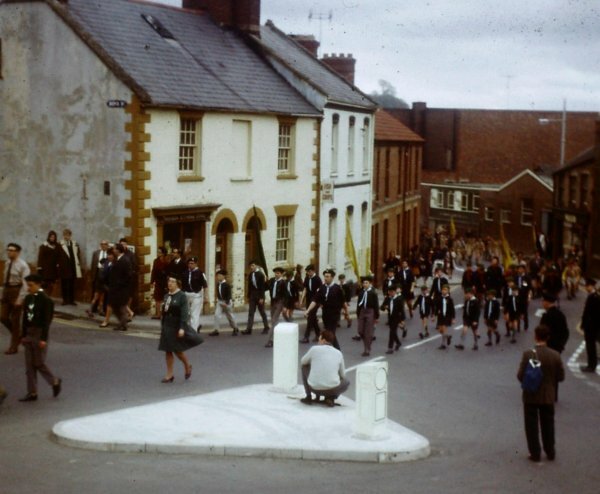 From South Street the parade turned into Hendford. Here it passes the whitewashed building that had been the Oxford Inn on the corner of Waterloo Lane, at left, and the Cottage Café. The Oxford Inn stopped trading in the late 1940's and later became the offices of the Petter & Warren architectural practice before being demolished in the early 1970s. 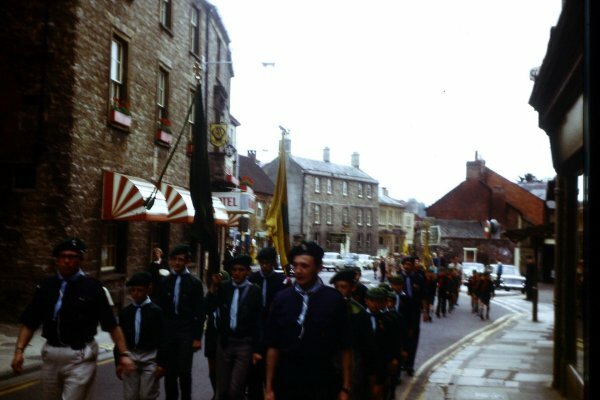 The parade continued along Hendford towards High Street. 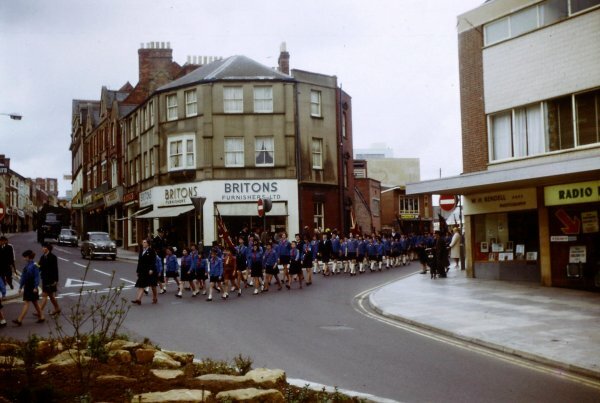 The parade then turned into High Street - seen here with the Boys' Brigade contingent passing the Mermaid Hotel in the days it was painted white with red window surrounds. Thank goodness it was restored back to its wonderful natural stone facade. The crowd waits for the parade in the Borough at 2:30pm. Do you remember Lennards in the old Deposit Bank building? and Plummers? and the clock on Boots' wall? (and when did that disappear?). .... and at 2:35pm the parade enters the Borough from High Street. 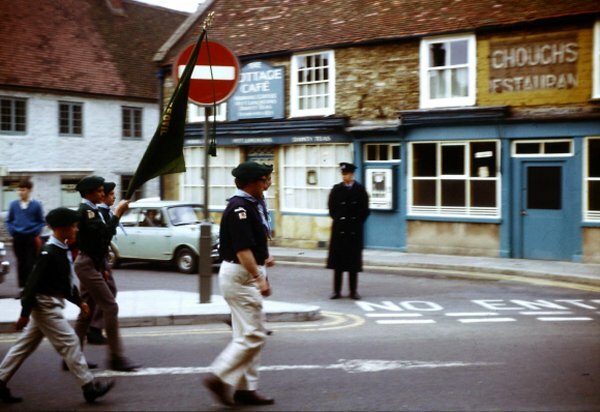 From the Borough, the parade passed down Silver Street, tuning into Vicarage Street. 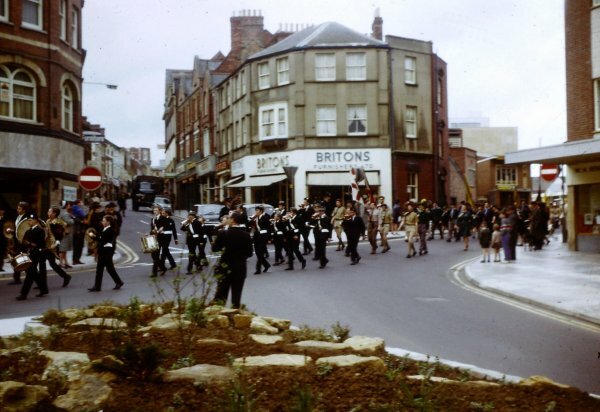 Here the parade, led by the band of the Boys' Brigade, is seen leaving Vicarage Street and entering the Triangle. Now, be honest, do you remember a rockery in the Triangle? 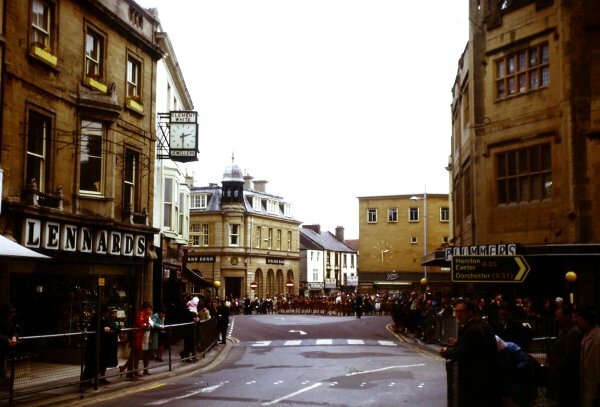 It seems to me that it should be resurrected now that the area is mostly pedestrianised. 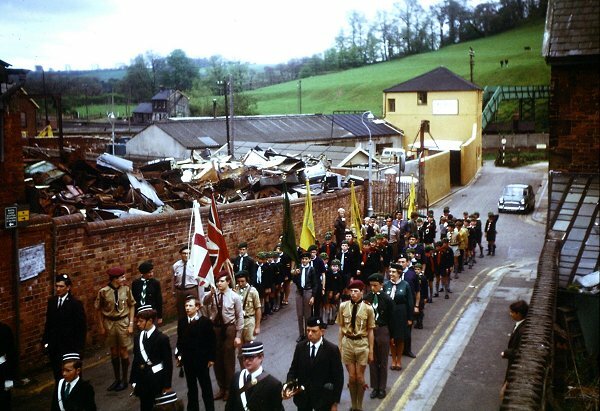 The contingent of Scouts and Cubs enter the Triangle. In the distance the Labour Club and the Albion Inn can be seen. At right are the premises of Hyde & Wakely who had been selling sewing machines (and bicycles in their early days) since at least 1903. The contingent of Girl Guides enters the Triangle. Notice Britons furniture shop on the corner of Middle Street and Vicarage Street and Walter Rendell's, the photographer's studio, on the opposite corner next to Radio Rentals. The parade comes to a halt as it filters into the Gaumont Cinema, at this time called the Classic Cinema.